PARIS — A jihadist wielding a meat cleaver was shot dead as he tried to attack a police station in Paris Thursday claiming to avenge French military action in Syria, a year to the day since the Charlie Hebdo massacre. The youth, who was apparently of Moroccan origin and aged around 20, tried to enter the building in the northern 18th district of the French capital wearing what was at first thought to be an explosives vest, but was later found to be a fake. The man’s fingerprints matched those on file for a thief convicted in 2013, a homeless man who self-identified as Sallah Ali of Morocco, born in Casablanca in 1995, the source said earlier. The drama unfolded just after President Francois Hollande concluded a somber speech at police headquarters to mark the anniversary of the attack on the Paris office of satirical weekly Charlie Hebdo on Jan. 7, 2015. Explosives experts were sent to the scene in the largely north African immigrant district of Goutte d’Or, near the tourist hotspot of Montmartre. The attacker was found to have been wearing a pouch under his coat with a wire hanging from it, but the device “contained no explosives,” a source close to the investigation told AFP. Interior Minister Bernard Cazeneuve praised the “remarkable work” of the security forces in the incident. “In a country where the level of threat is extremely high, the police, gendarmes, the security forces… are on the frontline,” he said. With France still grieving after the massacre of 130 people by jihadists in Paris in November — also claiming vengeance for France’s role in Syria — Hollande used his speech to call for greater cooperation between the security services to thwart attacks. “Faced with these adversaries, it is essential that every service — police, gendarmerie, intelligence, military — work in perfect harmony, with the greatest transparency, and that they share all the information at their disposal,” the president said. 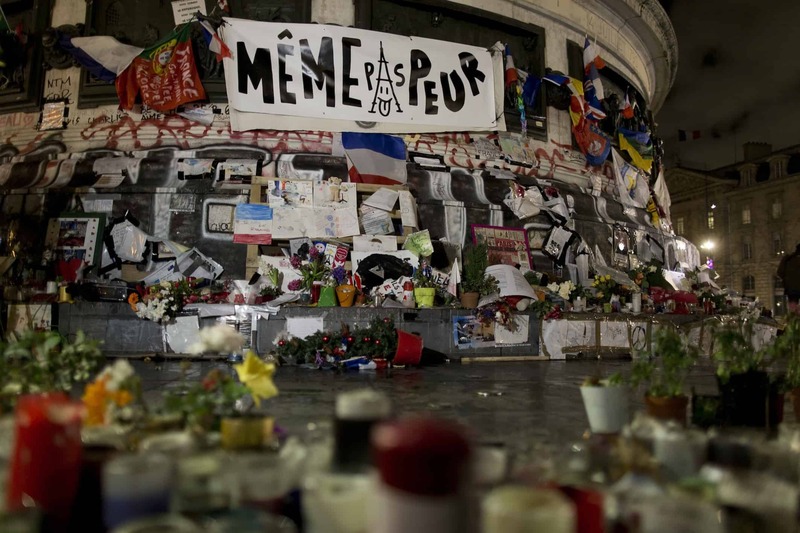 Many of the assailants in both January’s rampage and the attacks in November were known to French security services, having either travelled abroad to fight with jihadists or been blocked from doing so. Hollande said that since the attack on Charlie Hebdo, nearly 200 people in France had been placed under travel restrictions to prevent them joining up with IS in Syria or Iraq. A police bodyguard who was guarding the newspaper’s editor, Charb, was killed alongside him by brothers Cherif and Said Kouachi and they shot dead another policeman, Ahmed Merabet, as he sprawled on the pavement near Charlie Hebdo’s offices. The next day, a policewoman was killed by jihadist Amedy Coulibaly in the southern Paris suburb of Montrouge, apparently as he was heading to attack a Jewish school. Among changes set to be introduced in the wake of the November attacks are new guidelines allowing police to keep their weapons even when off-duty. The president reiterated his pledge to boost the number of police and armed gendarmes by 5,000. Rocker Johnny Hallyday will perform at a concert in Paris on Sunday to mark the day one year ago when 1.6 million people gathered in the capital in support of freedom of expression following the deaths of Charlie Hebdo’s best-known cartoonists. The weekly had been in the jihadists’ sights since it first published cartoons of the Prophet Mohammed in 2006. Since the attacks, it has moved to ultra-secure offices in a secret location, and has refused to tone down its provocative satire.